Jason Kelly | What's The Future of Books? Tower Records, which sold books at some of its retail locations, declared bankruptcy in 2006 and disappeared from the US retail landscape. Borders (BGP) declared bankruptcy earlier this month and began liquidating $350M of inventory Saturday at discounts of up to 40 percent as it embarks on closing a third of its stores. Barnes & Noble (BKS) is surviving as America’s largest bookseller, with 1,300 stores across the land, but its low margins combined with high fixed costs and inventory requirements make it look vulnerable to shifting consumer habits. Those shifting habits include a declining interest in reading, a preference for interactive technology such as games and other portable electronic devices, and a growing belief that short online summaries of a subject are better than detailed explorations in print. Another problem for booksellers both corporate and independent is that, like songs, most books are available as free downloads from the internet. It’s illegal, but goes on every day and is one reason that book sales are dropping. Scanning machines can turn any paper book into a digital version efficiently. Even that step is often unnecessary, however, because all current books begin as digital files and many of those late-stage files are leaked to the internet, beating the printed book to market and killing sales. The e-book revolution will help in that department, and in several others. Led by the Amazon Kindle (AMZN), shown above, e-readers protect content in files that can be opened only on a device owned by their purchaser. It’s possible for somebody to hack into such files, but is probably not worth the effort for a product that costs less than $10, where most Kindle titles are priced. So-called digital rights management (DRM) techniques should dramatically reduce the level of theft in the book business. In addition to forcing integrity on the book market, e-readers offer a convenient way to buy books instantly, carry thousands of titles on the go, and feel contemporary even while pursuing a pastime that’s been around for centuries. If you’ve ever purchased a Kindle book on Amazon with one click, then waited a few moments for it to appear magically on your device, you know firsthand the joy and fun the Kindle has sprinkled upon the book market. 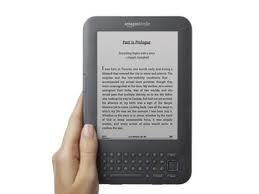 Another benefit of the Kindle is the ease with which it enables anybody to self-publish. Publishing your own book used to involve expensive layouts, ISBN barcodes, very expensive printing, shipping, warehousing, shipping to bookstores, paying to ship unsold titles back to your warehouse from bookstores, and so on. It was a low-margin, risky proposition that saw most titles fail to benefit their authors in any way beyond personal satisfaction. Not anymore. Publishing on the Kindle requires no complicated layout, no ISBN barcode, no printing, no shipping, and a generous profit-sharing structure. A first-time author completing a book on Friday can start selling it on Saturday and achieve greater profit per copy sold than if she’d gone through the lengthy, often heartbreaking process of querying agents and publishers, finally finding the book a home, waiting another year or more until it’s on shelves, and then waiting another six months for her first royalty payment. At the end of all that, the profit-per-copy for most authors is a tiny fraction of the price paid by readers, and the authors who ever get far enough to discover that are the lucky ones. Most wash out earlier in the process without seeing one dime of profit. They just collect rejection letters. On the Kindle, it goes like this: finish book, upload file, promote, sell, get paid ten times more per copy sold than you would be paid via traditional publishing. Time previously spent convincing publishers of a book’s worth can now be spent convincing readers. The market becomes the only judge. Thus, not all is lost in the world of books. The trend away from printed books to e-books may create a trove of previously unavailable material, for sale to readers usually at a price lower than printed books cost, but in a structure that rewards authors more than they could earn in the printed-book system erected over centuries. The book market is trending toward serving just three parties: writer, seller, reader. The many other parties involved in the publisher-printer-shipper-bookstore keiretsu are in trouble, but writers and readers will be fine. While Amazon and other e-book platform sellers should do well, their margins have thus far proved so thin that the long-term profitability of e-books to sellers isn’t yet known. Sellers are giving away a lot in an attempt to become the dominant platform. Once a winner emerges, that company should enjoy more pricing power. The winner is shaping up to be Amazon with its Kindle. Last month, Amazon Vice President for Kindle Content Russ Grandinetti told a Digital Book World conference that, for Emma Donoghue’s bestselling novel, Room, “total Kindle sales are equal to 85 percent of Nielsen BookScan’s print sales number.” Overall, Kindle sales alone account for 40 percent of all sales across all formats for Room. Beyond that one title, Kindle editions of all books outsell their hardcover editions by a 3-to-1 margin, and Amazon sells 115 e-books for every 100 paperbacks it sells. For this week’s discussion, please weigh in with your thoughts on the future of books. Will print survive? Will independent booksellers thrive now that their niche specializations look stronger than big box retailers unable to keep up with Amazon? Will a non-Kindle device such as the iPad (AAPL) take the field by storm, even though its backlit screen is hard on the eyes over long reading sessions and glares outdoors? There are many ways forward in the book business. As an investor, author, and reader, I’d like to know your ideas. Click the comment link below to join in! This entry was posted in Books, Discussion of the Week and tagged iPad, Kindle. Bookmark the permalink. Both comments and trackbacks are currently closed. There is a point that I wanted to raise with regards to the economics around books. I am an avid reader and purchase most of the books I read used for a fraction of the price of a new book (either physical or electronic). I still haven’t found enough incentive to switch to e-books for that reason. I definitely agree that e-books will dominate (but still be completed by print) the market in the future, but the economic incentives both on the device side and book cost need to go down further in my opinion. Perhaps subscription, rental-based or transferable models might further help in that direction. Thanks, Omar. How are you paying a fraction of the price of a new book? Waiting until it’s used, a discount outlet, something else? A rental e-book model would be interesting, similar to online video rentals where the file just disappears at the end of the rental period. As the seller, I’d probably slap on a message half a day before the rental book expires, asking if the renter would like to pay just $X more to own the book forever. Thanks for the reply. The rental model described above would work. The other could be that people can resell/transfer their e-book to others and recuperate part of the cost in case they are not interested in keeping it. As for the used books I usually wait on the book, and then buy it used on Amazon. I have been able to get numerous best selling books in the areas of economics/leadership/business for 1 cent + S&H of $3.99. The books are usually in great condition. That being said, sometimes I do have to settle for an older edition to get such a deal. I don’t have a Kindle or any e-book reading platform and don’t plan on buying one. When I’m out at a bookstore and see something I like, I take down the info (usually take a picture of it with my phone) and go home and buy the book on Amazon. I always go for the used copies first. I’ve spent as little as 17 cents (plus S&H) on books that I would have otherwise spent $20 or $25-plus on for a brand new copy at the bookstore. To date, I have not been disappointed in the condition of a book I’ve bought this way. I can’t remember that last time I spent retail on a book. For me, I’m sticking with the paper copies. There’s something about having a book to see, touch, hold, and put on the shelf when I’m done with it that I don’t want to give up.